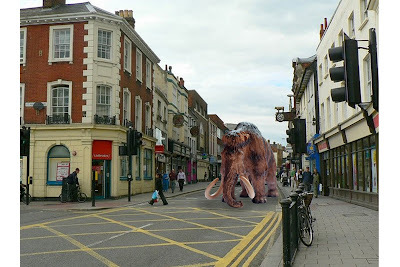 News from the stores: Mammoth Traffic Problems Hit Bedford High Street Again!! Mammoth Traffic Problems Hit Bedford High Street Again!! Like most of us, I have watched films and read books about life in the Ice Age. More often or not these films have involved a variety of hairy but funny and cute animal characters either struggling through an endless frozen landscape or fleeing catastrophic floods. Though I enjoyed the films I did not really give them a second thought, until recently when my attention was grabbed by some information that I came upon as I was sorting through our database. The records showed photographs of Mammoth tusks and Woolly Rhinoceros bones! 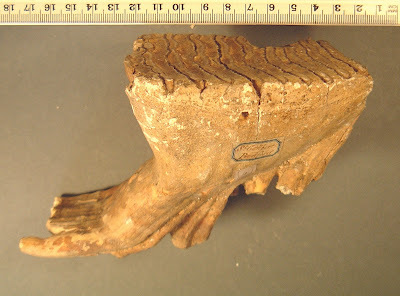 As I got more and more drawn into the database I discovered that a whole host of Ice Age mammal remains have been recovered from under our pavements and roads, and not just in one location but all over the place. 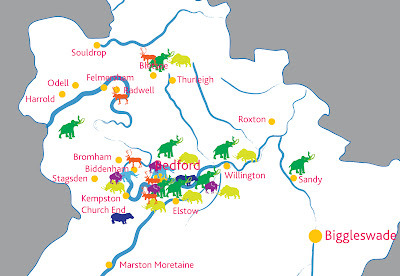 Map of Ice Age Mammals found in Bedford and surrounding areas. The finds include Mammoths, Straight-tusked Elephants, Reindeer, Hippos, Bison and Woolly Rhino's. ﻿ You can download a PDF of this map here. The story with our collections it seems starts in the 1860s and is directly connected to quarrying for gravel in the river valleys. This gravel was an essential building material for the urban expansion of Bedford town, its roads and railways, in the Victorian era. During this period the digging of gravel was done by hand with shovels and wheel barrows. As the workmen dug down into the valley soils they were in a brilliant position to notice anything unusual and odd in amongst the gravel pebbles. The finding of fossils and old objects from the ancient past in the gravel was commonly known and often antiquarians would cultivate and encourage the men to find and keep such finds by buying the items from them. Though a large part of our Ice Age mammal remains were collected during the mid to late nineteenth century, finds from modern day mechanised gravel extraction quarries are still regularly made and these form an important part of the collection too. So, it appears that our image of a mammoth walking down the High Street is not fictional but is based on solid fact. 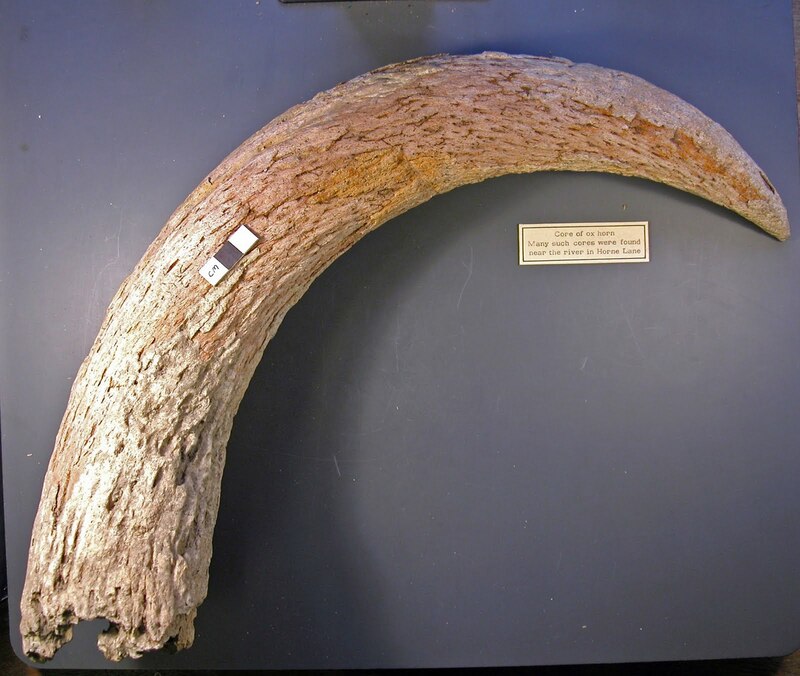 Finds of Mammoth bones and tusks have been dug up from not only the High Street but from Horne Lane, Midland Road and St Cuthbert’s church yard. 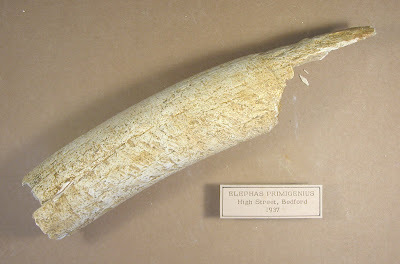 Even more amazingly it is not just mammoths, remains of extinct Bison, Reindeer, Elephants and Woolly Rhinoceros have come to light too. So, next time you are walking along the Embankment, the High Street or out in the Ouse Valley countryside imagine you are walking with Ice Age mammals. I knew i wasn't diggin' deep enough?